Welcome to the 'Our Young Stowaway' blog. My name is Liam Maloney and I have worked with the Shackleton Exhibition since 2014. I maintain the Facebook page that contains all things polar and adventurous, particularly from the time known as the Golden Age of Antarctic Exploration. 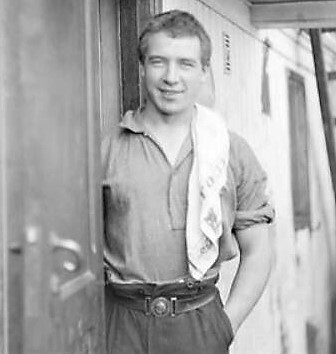 This blog shares a booklet that I wrote a few years ago about Perce Blackborow, the young Welsh man who stowed away aboard Shackleton's ship, the Endurance, when she left Buenos Aires in 1914 bound for the Antarctic region. Perce's story is a strong favourite with fans of the wider Shackleton expeditions and makes for great research. I hope you enjoy reading about Perce's life before, during and after Shackleton's Imperial Trans-Antarctic Expedition. Many thanks to Nicholas Houldsworth for initially introducing me to the exhibition and, unintentionally, opening up a valuable space for me. I can only express my gratitude to John O’Reilly, the managing director of the exhibition, for the opportunities given me, as well as the trust, belief and conviviality that comes with knowing him. My colleague Donal O’Neill has been more than welcoming and accommodating since my arrival at the exhibition. His openness in sharing insights with me, and the recognisably sharp edge to his humour and conversation, have both been greatly appreciated. We are grateful to John Blackborow for visiting the exhibition at Dún Laoghaire and for sending us his writing, ‘1916 May 17th Elephant Island’, much utilised in what follows. I would like to thank all of the visitors to the exhibition. I learned much from simply listening to those that came to the exhibition with interesting ideas, context, and previously unknown sources and avenues for new material. To those willing to converse (especially those willing to indulge my tangents and historical verbal meanderings) about Sir Ernest, the Endurance and all polar exploration: thank you. Thanks, in particular, to James Grannell for his frequent visits to the exhibition, across the seasons and many a Sunday.